This was my second great lunch at Marea within the last few weeks. Michael White was not in the restaurant, but it didn’t matter one bit, the food and service were just spectacular as they always are. Is there a better way to start lunch than with Cedric Bouchard’s 2006 Blanc de Blancs La Haute-Lemblée and a dozen oysters? I doubt it. The wine was absolutely beautiful, even a touch reserved, but the trademark Bouchard elegance was on full display. Bouchard’s Champagnes remain some of my very favorite wines on the planet. This bottle was stunning. My tuna tartare was absolutely beautiful. The little details executed perfectly, along with a good dose of southern Italian sunshine elevated this dish beyond the standardized versions one finds elsewhere. The razor clams were even better. The broth, with its scents of saffron, basil and fennel, was bold, lusty and full of Mediterranean character. I loved it. Anselme Selosse’s NV Substance was a different beast altogether next to the Bouchard. The intense, almost orange color gave a good indication of the aromatic and flavor profile that would follow. Substance is Selosse’s original solera-style Champagne. It typically shows quite a bit of tertiary complexity when released. This 2008 disgorgement naturally revealed even more nuance in that direction while never abandoning its essential minerality. It was a fabulous wine that continued to grow in the glass. Luigi Moio’s Quintodecimo wines are some of Italy’s most sought after cult bottles. The 2009 Greco di Tufo Giallo d’Arles pushes the boundaries of what is possible with this great indigenous variety. Initially quite honeyed and textured, the wine gained focus and varietal definition in the glass. It was a showstopper from the very first taste. 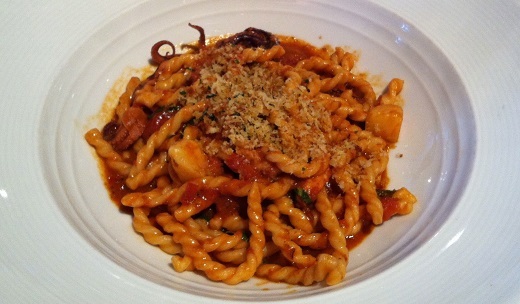 Marea’s fusilli with braised octopus and bone marrow was fabulous, as it always is. The lusty, full-bodied flavors worked beautifully with the richness of the wine. I stole a taste (or two!) of my wife’s semolina pasta with crab, Santa Barbara sea urchin and basil. It took an extraordinary amount of restraint not to order a portion for myself. The wild sea bass was excellent, even if it didn’t thrill me the way some of the other dishes did on this day. I am not much of a dessert eater, but my chocolate crostata was truly stellar, as were the other sweets I sample across our table. Readers who have a chance to eat at Marea should not miss it. Both of my recent visits more than live up to the praise the restaurant has received.